Farm Fresh, Iowa Farm Bureau’s blog about the people who bring you your food, fuel and fiber and the issues they face. Why an Iowa Farm Bureau Blog? Iowa’s water is like a college basketball team that’s elevating its play heading into the tournament. It’s not perfect (the “talking heads” on the sidelines can point to its flaws), but there’s no doubt that the team working to improve Iowa’s rivers and streams is gelling and each victory along the way is elevating its standing. 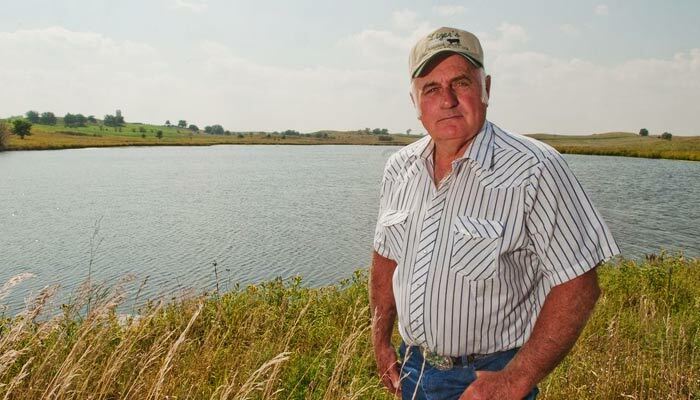 As more farmers become familiar with Iowa’s EPA-endorsed Nutrient Reduction Strategy, new and varied conservation practices are being used to improve Iowa’s water. Iowa farmers planted 472,500 acres of cover crops in 2015, a 35% increase since 2014 and a whopping 4,625% increase since 2009, according to Iowa Learning Farms and Practical Farmers of Iowa! 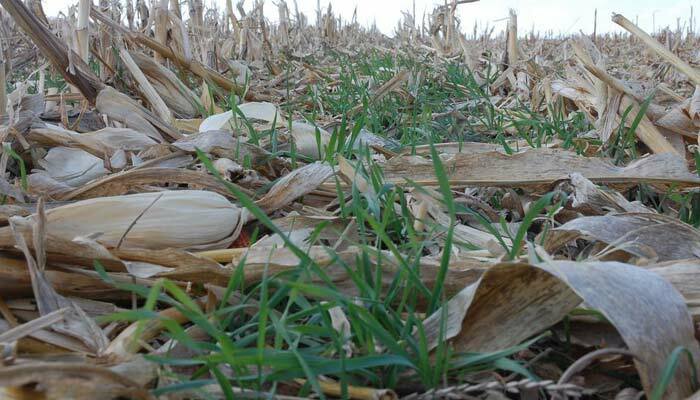 That’s significant because cover crops (plants like oats and rye that continue to cover the ground after corn and soybeans are harvested) are seen as one of the most effective in-field practices to help protect Iowa water from nitrates! 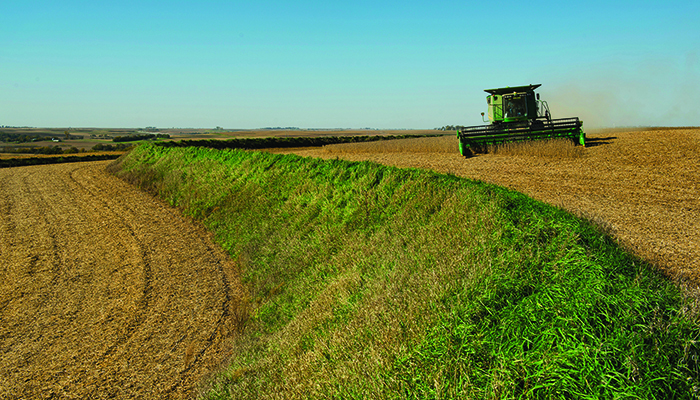 Iowa farms lead the nation in acres of grassy strips within and along the edges of fields (to protect our water from erosion), and the number of acres grows almost every month, according to the Farm Service Agency. In fact, the number of acres in Iowa has increased 222% since 2001! Farmers voluntarily restore wetlands in strategic areas to help prevent nitrates from reaching our water. 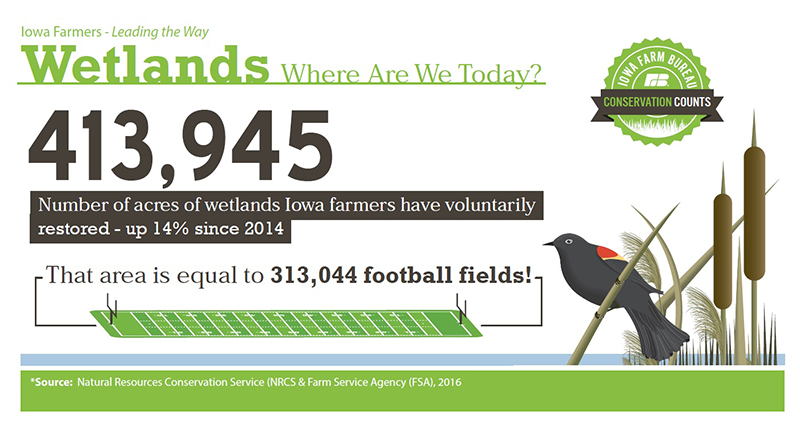 According to NRCS and FSA, Iowa farmers have restored 413,945 acres of wetlands (equal to 313,044 football fields), up 14% from 2014! Terraces are another in-field tool farmers use to protect water quality. According to the Iowa Department of Agriculture & Land Stewardship, terraces (grassy ridges installed in fields) prevent 95% of the sediment and phosphorus from eroding. Farmers have installed 515 miles of terraces (through Iowa’s state conservation cost share program alone) in the past year, a distance stretching across Iowa – twice! Water quality improvement requires commitment over time. Iowa is starting to see the early fruits of that commitment. For example, according to the Iowa DNR, the number of Iowa streams with self-sustaining trout populations has grown 9-fold since 1980, and according to an Iowa Soybean Association study, nitrates in the Raccoon River (which feeds Des Moines’ drinking water) have trended lower by nearly 25 percent in the past 15 years. Additionally, a 2014 U.S. Geological Survey study of several decades of nitrate concentration and flow data from 10 major Iowa rivers indicates that concentrations of nitrates decreased from 2000-2010 in all basins. 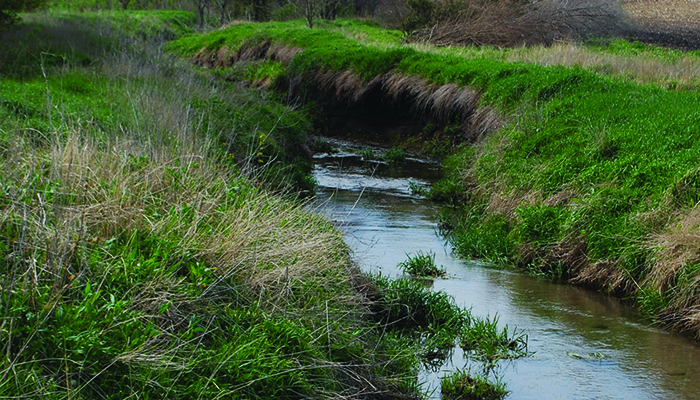 Urban/rural collaboration is producing improvements in the Hewitt Creek Watershed (eastern Iowa), the Rathbun Lake (southern Iowa), and in other communities around the state. Farmers are using precision equipment to be more exact with their fertilizer applications. National, state, and local experts believe in the momentum Iowa is building – including the U.S. Environmental Protection Agency’s (EPA) Region 7 administrator (covering Iowa, Nebraska, Kansas, and Missouri). Iowa still faces water quality challenges, but farmers are taking them on. It’s healthy to look at this issue with a critical eye and challenge ourselves to continuously improve. Just don’t sleep on a team that’s peaking at the right time. For more information about Iowa’s water quality progress, visit ConservationCountsIowa.com. By Zach Bader. Zach is Iowa Farm Bureau’s Online Community Manager. This entry was posted on Thursday, March 10th, 2016 at 9:47 am and is filed under Uncategorized. You can follow any responses to this entry through the RSS 2.0 feed. You can leave a response, or trackback from your own site. Farm Fresh encourages readers to comment and engage in respectful conversation about the content posted here. We value thoughtful, polite and concise comments that reflect a variety of views. To achieve that, all comments will be moderated prior to posting. Show your support for food freedom by including the Choose2Choose badge on your webpage, blog or Facebook page. The Farm Fresh Blog is Moving! GMO versus organic? Why not both?